Vicki Cain and Warren Winterson examine skeleton's hand. Teaching was a second passion for both Cain and Winterson. Colonel Alvin Chandler counts down the days where the working phase of his life will come to an end. After retiring from 22 years in the army, Chandler ended up teaching Junior Reserve Officer’s Training Corps (JROTC). Now Chandler is ready to go into his second retirement and sees it as just another phase of life. Much like Chandler, teaching was a second career for Christy Eliades. “I actually was an interior designer for about 10 years and then when we moved to Hopewell, Virginia, I felt like I needed to reinvent myself because my job was in Richmond…,” Eliades said. Each teacher has their different reasons for teaching and what they enjoy most. “I became a teacher primarily out of a desire to make a difference, however small, in the lives of my students,” chemistry teacher Warren Winterson said. Winterson also was not always a teacher, but he decided to become a teacher to share his love of chemistry with young people. “What I have enjoyed most about [teaching] is sharing my love of chemistry with students while helping them learn some fairly difficult material,” Winterson said. For many teachers their favorite part of teaching is the connections they make with the students. 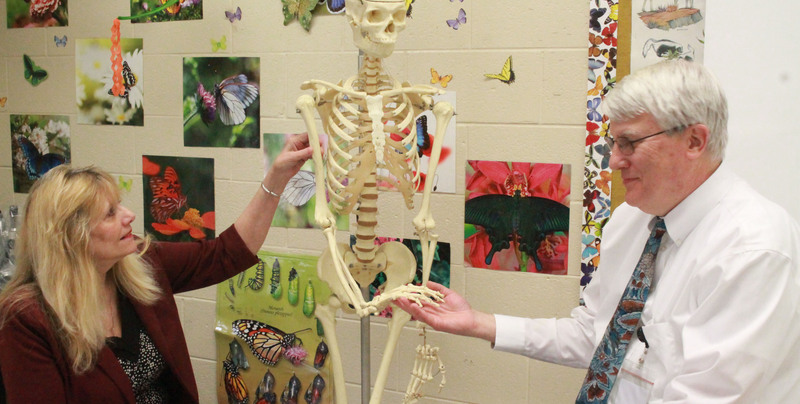 “I know that from one year to the next it’s always something different because you’ve brought a whole new group of people in and I get to meet a whole new crowd and it’s just nice to see people who are interested and curious and still want to learn,” dual enrollment biology teacher Vicki Cain said. Cain originally planned to go into a career in pharmacology but soon found that she enjoyed the interactive part of science over the chemical side. “…I kind of switched my ideas midstream of my undergraduate work and as I got more into the biology I enjoyed that more and I liked being outside and doing a lot of field work so that kept me closer to nature,” Cain said. After 41 years of teaching Cain finds her retirement to be a bitter-sweet ending to this chapter of her life. “It saddens me a little bit because I have to leave the classroom and the fun that I have with my students and helping students learn. But I think it’s going to be exciting because it’s a new chapter in my life where I can do things that I hadn’t had time to do over the summer,” Cain said. Some of the teachers, such as Winterson, have plans for their retirement. For Winterson, his goal is to spend quality time with his family. “In retirement, I look forward to spending more time with my family, particularly my grandchildren that seem to be growing up too fast.” Winterson said. However, others do not have specific plans other than to escape the day to day work environment and just enjoy the life they have worked to live. “That’s the interesting part about it, you just don’t know what to expect, but I’ll be able to do some stuff that I haven’t been able to do in the past,” Coach Michael Roberts said. Both Michael and Anne Roberts plan on retiring this year and enjoying their retired life together.